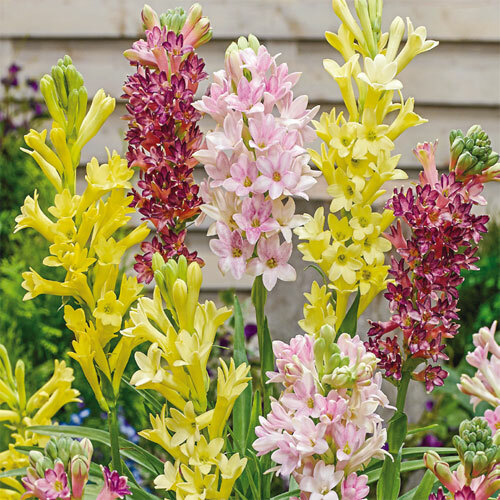 Grace your garden with this fragrant mixture. Multi-petal flowers of yellow, pink and purple look great in your garden or enjoy them indoors as a cut flower. The fragrance of tuberose has long been used in perfumes to provide soft middle notes that linger. This seductive aroma has made tuberose one of the most sought-after blooms for fragrant cutting gardens and as a border plant. Though native to Mexico, tuberose performs very well in sunny northern landscapes. Lovely spikes of soft flowers appear in early summer and retain their beauty and sweet perfume all season long. Funnel-shaped blooms in spike-like racemes. Smooth-edged or minutely-toothed fleshy leaves clustered in more or less rosette fashion at or near the base of the branchless flower stalks.